Our dear companion, #happycat Poe, died on Wednesday. We came downstairs on Tuesday morning to find that she had had a stroke. Her head was twisted sharply to the left. She wouldn’t eat her food – even the most freshly cooked salmon couldn’t tempt her. She was still managing to walk around, but collapsed into short sleeps, exhausted by the effort. On Tuesday night, we mossed her up. She slept in one of her favourite places next to Stephen on the sofa. And the next day, we picked her up very gently from her flowery bed and took her to the vet. 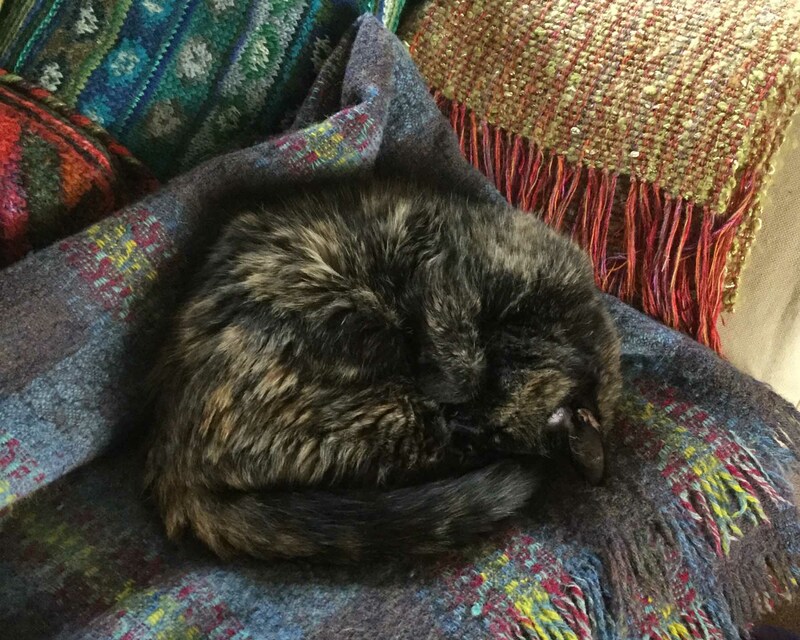 She has been our excellent companion for over 19 years – she was a very very old lady. 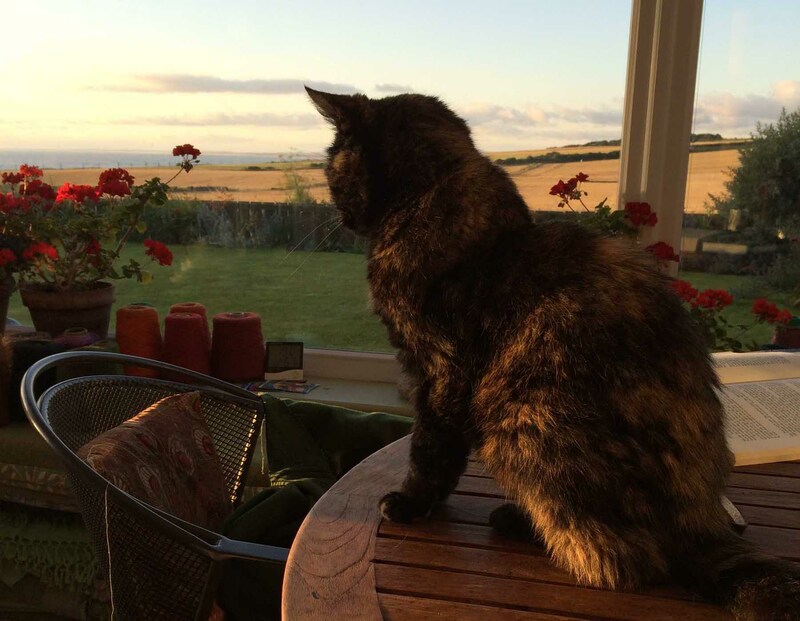 You can may have read about her early life with us here, and some of you may remember also reading how worried we were earlier this year, when two younger cats came to live with us. Despite our misgivings, that was not a problem. The three cats learned that they had to share human attention, whether in the morning … Or round the fire in the evening … You might even think Ilsa and Poe were friendly companions here … Sadly the picture also highlights Poe’s loss of weight against the plumper Ilsa. Sometimes the new kits were a little bit mean … now kits, it’s not nice to mock poor Poe who just wants to get into the house … Our little Poe became markedly more absent-minded in these last days. 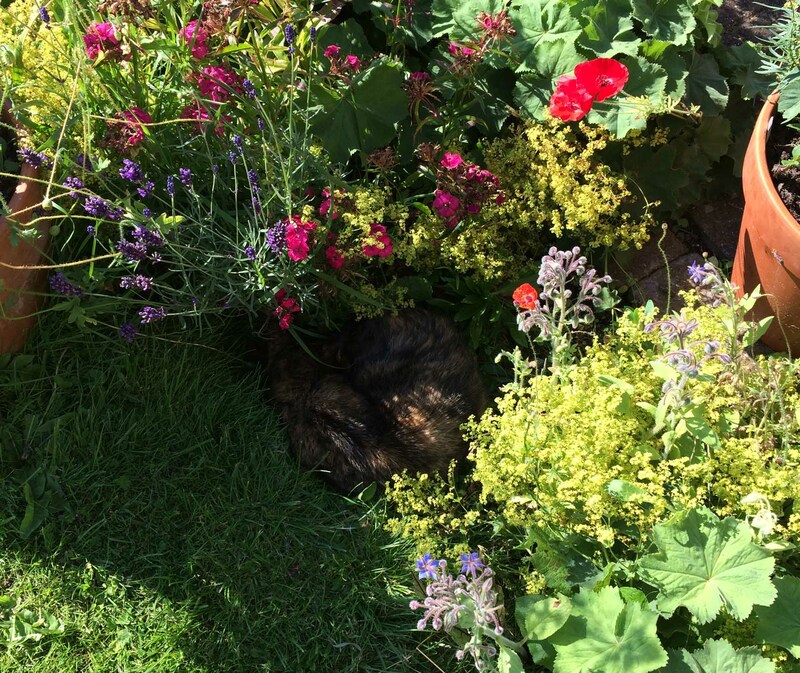 We would find her asleep in odd places… But she could surprise us too. 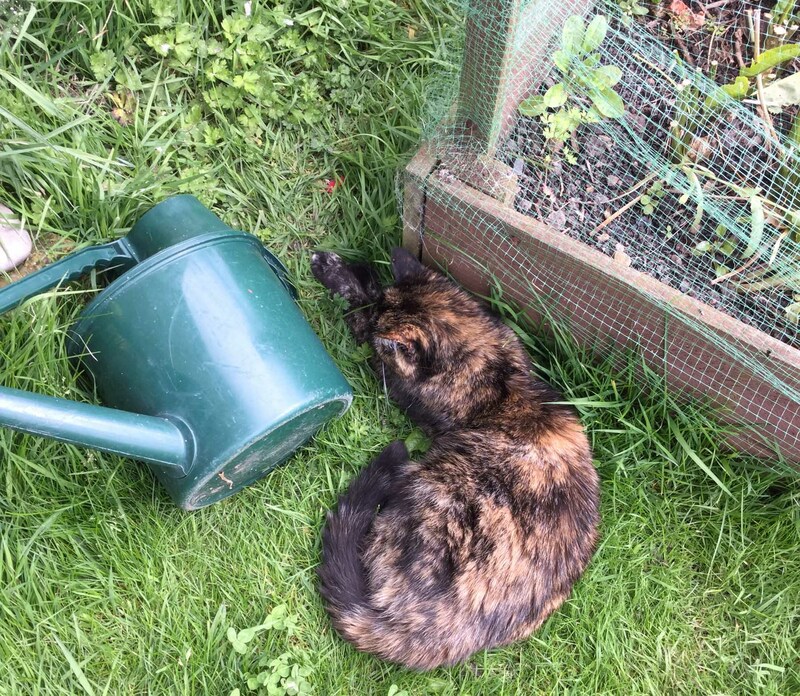 After two year’s without catching any mice, she recently caught one, showed it to the very interested Ilsa, and then proceded to eat every little bit of it … Oh, she did make us laugh! She was so spoilt with little treats that she grew to expect them long before they were offered. And, on occasion, her love of icecream overwhelmed her. 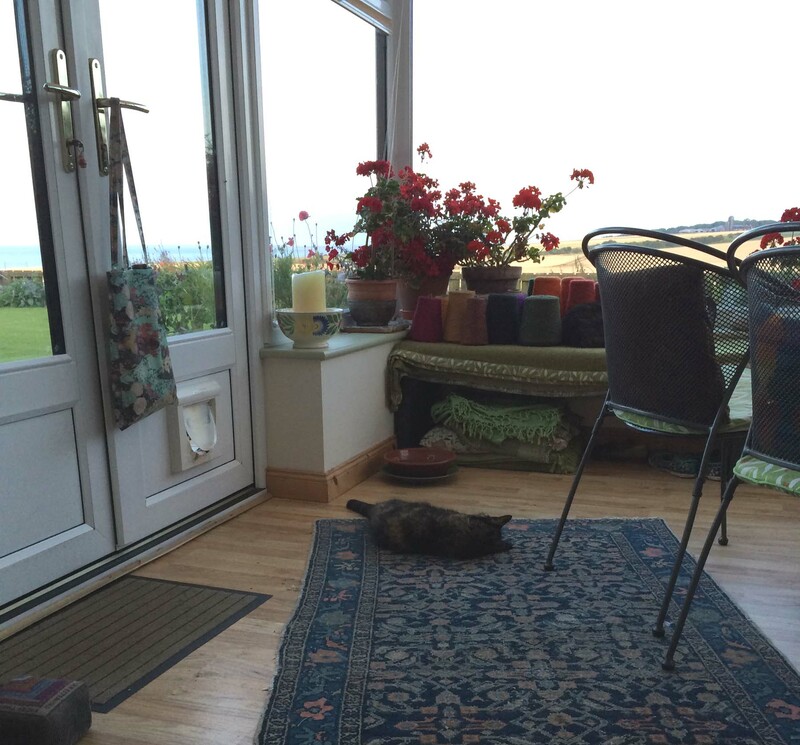 She kept us company as we read … Worked in the conservatory … Our dear friend, Poe, who ventured so bravely up to Northumberland with us – surveying her empire. 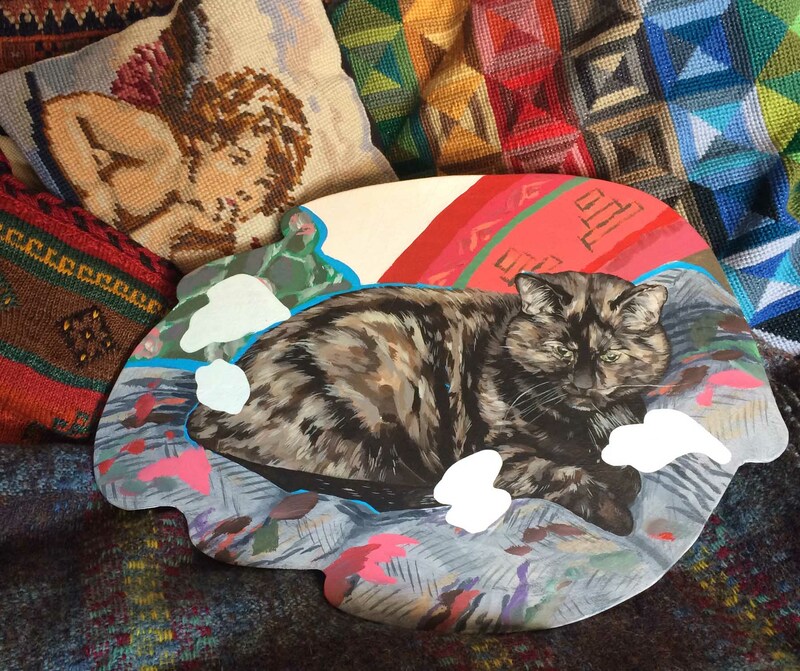 She was immortalised for us in this wonderful painting by Flo Brooks. #happycat Poe remains with us, in her place on the sofa. Oh bless her. The loss of a pet is devastating. Lots of happy memories though. Yes, in the sadness there are many many happy memories, and I’m sure you’d agree that it is one of the great pleasures of blog-writing that you have occasion to draw all those together. A sweet tribute to a much-loved member of the household. I am so sorry my dear. What a lovely tribute you have managed for your beloved Poe. Thank you for sharing your lives. My heart is heavy for you all but so pleased for all the lovely memories you have to carry you forward. Thank you, Deb – such kind words. We do miss our pets so much. [J+D] We’re very moved by your eulogy for Poe – both words and pictures. You know about our recent loss of 21-year old Molly, so you know we do understand your loss! It’s good that the young ones knew Poe. Dear Jonathan and Denise – thank you. I was thinking of your Molly as we watched our Poe getting weaker and weaker – you just have to let them go, but it is so sad. Oh, Susan – what a sweet thing to say. Thank you 🙂 yes, happy memories even if sad present. 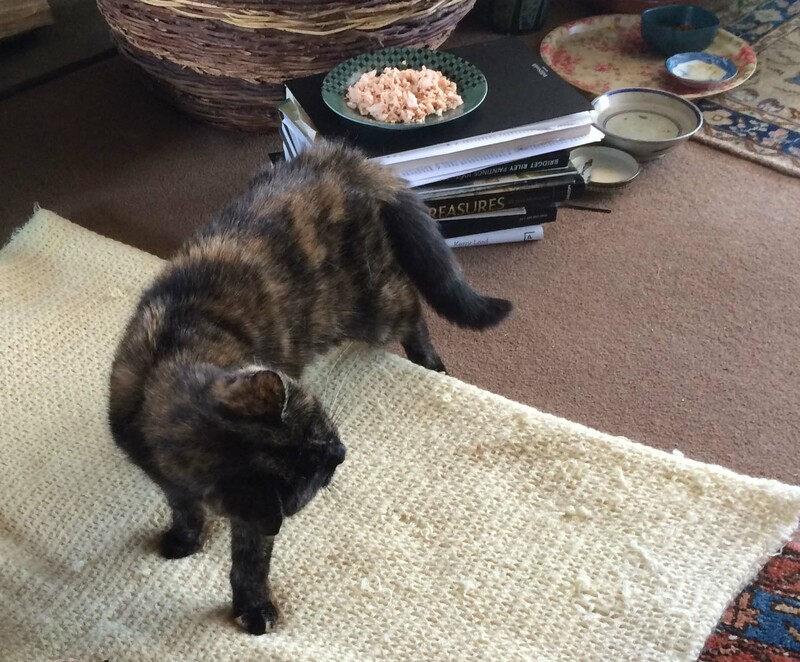 Aah – you too had a very elderly cat – it is so sad. I suppose with all that length of time in our lives, we cannot help but mind the passing. Thank you for your comforting words. I’m sorry you have lost your kitty! I know how it feels, too. She sure was a beauty. Oh, thank you so much – such kind words for our old Poe. I’m so sorry to hear about your sweet kitty Poe. Thank you for the lovely eulogy, and I hope you don’t mind that I enjoyed the photos so much, peeking into the less-seen corners of your world, including your man, looking so happy. 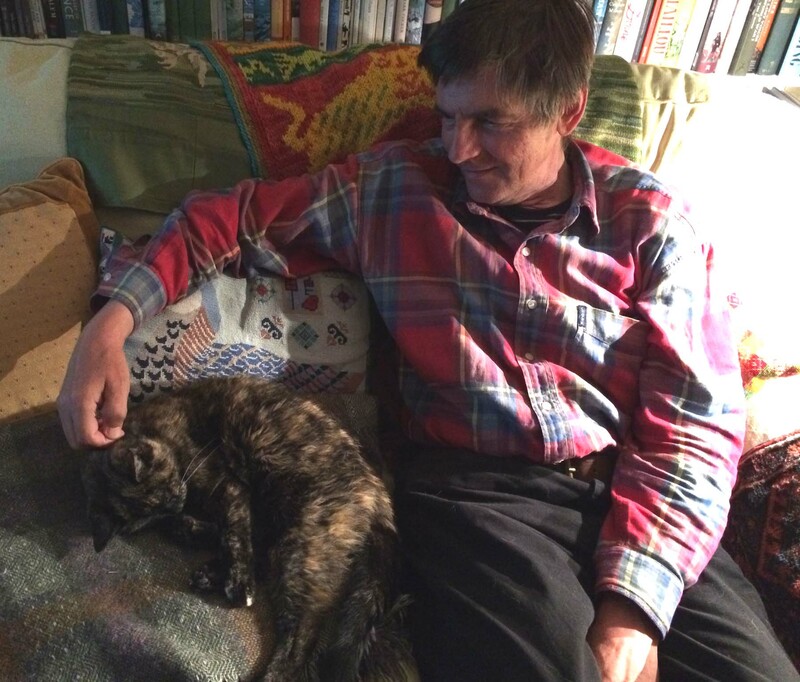 I don’t mind sharing our homely pics at all, Frith – I’m just so touched by all these kind words about our very ordinary, but very much loved moggy Poe. Thank you, dear Alina – such kind words. Dear Stephen and Katherine, I have never owned a cat, nor do I think of myself as a cat person, but it has been a real delight to glimpse something of your shared life together with its companionship and simple pleasure. I am sorry Poe has passed from view and sad for your loss of her company. Thank you, Rebecca – I am so glad our companionable Poe has spread her spirit through the interweb! She was a very sweet natured animal (not all cats are!!) 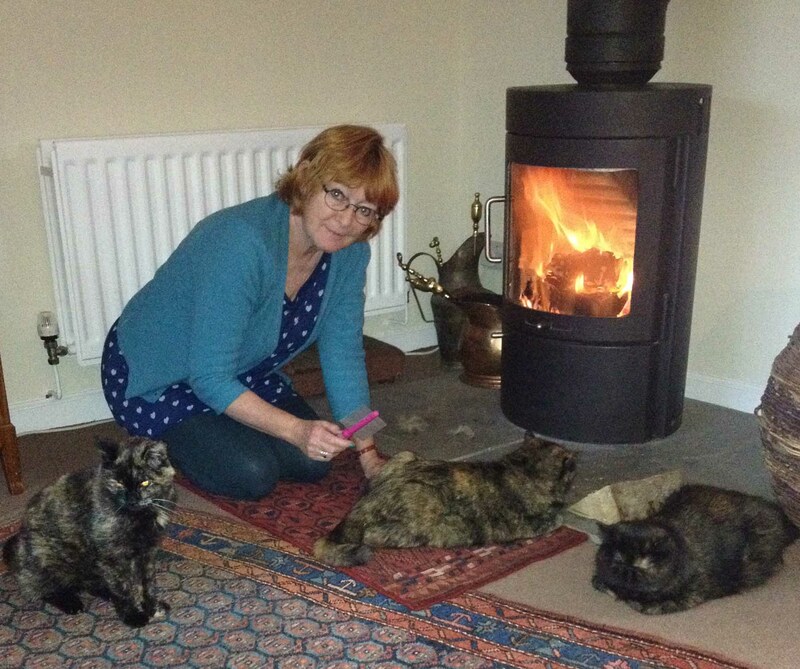 so we were lucky to have her company – and she was definitely part of our Northumbrian escapade! Still very sad and strange without her (though the little kits do their best to keep us busy), and I guess it will remain so for a while to come. Sorry for your lost…bye beautiful kitty..